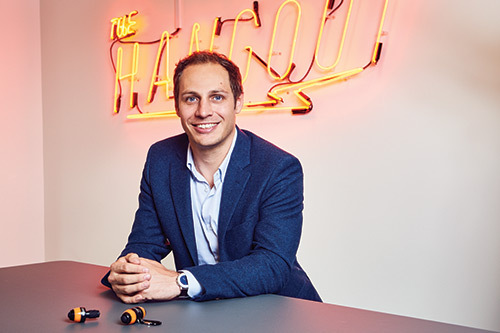 City entrepreneur Luca Amaduzzi hopes to help reduce cycling-related deaths with the help of his invention WingLights, which are direction indicators for bicycles that attach onto the rider’s handlebars with the aim of making cyclists more visible to motorists. Nine cyclists were killed on London’s roads last year. It is a sobering figure but one which another City entrepreneur hopes to help reduce. Luca Amaduzzi (MSc Innovation, Creativity and Leadership, 2013) founded CYCL in 2015, alongside business partner Agostino Stilli, a robotics PhD student from King’s College London. Together they invented WingLights, which are direction indicators for bicycles that attach onto the rider’s handlebars with the aim of making cyclists more visible to motorists. WingLights have made a fantastic start. Earlier this year, they successfully pitched their product on BBC’s Dragon’s Den, securing £45,000 funding from Moonpig.com founder Nick Jenkins. Currently CYCL have two versions of their product: WingLights Fixed, which are permanently attached to the bike and WingLights Mag, which are magnetically removable from the handlebars. Both versions are activated by tapping them and flash at the same frequency as a car’s indicators, making it easier for drivers to see cyclists. Luca came up with the idea of WingLights after feeling unsafe cycling around London. He says they are designed to give cyclists (and motorists) extra peace of mind. WingLights support safe cycling by ensuring that cyclists can be seen, especially when changing lanes or at roundabouts. They aren’t a substitute for being aware and alert but are intended as an extra support. I enjoyed working in the Lab, meeting, working and interacting with other entrepreneurs. The mentoring and useful introductions from all the networking events really helped me in the early stages. Technology Sydney and has freelanced for the Sydney Morning Herald, The Daily Telegraph and BBC World Service.